In my search for fall events and activities to share, I was reminded of the North American Wife Carrying Championship, hosted by Sunday River in Bethel, ME, and scheduled for October 11, 2014. Now in its 15th year, this event offers both terrific entertainment and pretty appealing prizes. The legend behind the North American Wife Carrying Championship is based on 19th century Finnish legend “Ronkainen the Robber” who had high qualifications for the men he accepted into his band. To prove their worth, men had to compete through a difficult course with a heavy sack (or woman grabbed from neighboring villages) on their back. Ah, the joys of womanhood. Other sources of information such as Wikipedia and wife-carrying.org offer variations on this tale, but they all share the same root. In 1991, Finland hosted their first modern-day wife carrying event, and admitted foreign contestants in 1995. One of the “prizes” of winning the North American Wife Carrying Championship is entry into Finland’s World Championships held the following summer. In addition, the lucky winning couple will take home the wife’s weight in beer and five times her weight in cold hard US dollars. In summary, if I were in Maine, I’d want to check this event out, and even participate in it (don’t worry, Nick, I’m not volunteering you to carry me over obstacles at a run….yet). I’m also pleased to report that my research revealed that I actually know one of the recent winners, who is a family friend. Go Rocky! Although this is the event title that caught my eye and intrigued me most, the charming town of Bethel, Maine, is a perfect example of what Maine has to offer in all four seasons. October in this part of the state will be full of the vibrant colors of fall foliage, fall scents and activities (apple picking, fatty, delicious fair foods, and more), and all the busy preparations for winter’s rapidly-approaching ski season. It’s worth noting that this wife-carrying event is just one component of the Fall Festival in Bethel, running on both October 11th and 12th. Other events include outdoor concerts, the 31st annual Blue Mountain Arts & Crafts festival, Sunday River Sports pre-season sale, pony rides and games for kids, and a wine tent, among others. This makes a great weekend trip to the mountains for the entire family! Categories: Drink, Eat, Play, Shop | Tags: Bethel, fall festival, Maine, Sunday River, wife-carrying | Permalink. It may not feel much like spring in Maine right now – despite Wednesday, March 20th, being the first official day of spring – after all, the state just received another 10-18 inches of snow, depending on your location, and there’s a potential for more in a storm system next week. But, spring is here, and with it comes a blog post on spring activities in Maine. Given the recent snowfall, spring skiing should be at the top of the priority list. As temperatures start to rise, but the snow in the mountains remains, there are rarely better skiing days. After bundling up for the slopes all winter, there’s nothing more enjoyable than feeling the sun on your face, wearing a fleece, and whipping down the mountain. For great spring skiing, check out Sugarloaf USA, Saddleback, Sunday River, and more. One of my favorite things about Maine is that there are four true seasons – you get a real spring, short summer, real fall, and a long winter – and these transitions bring special activities year round. As spring progresses, activities like hiking, gardening, and attending spring and early summer festivals get you outside and enjoying the warm weather. Stay tuned for a post this week on the Coastal Maine Botanical Gardens in Boothbay, Maine. 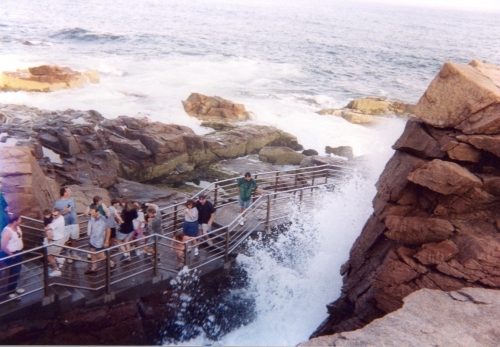 Hiking, biking, and experiencing the great outdoors doesn’t get much better than in Acadia National Park. Their extensive carriage trails provide manageable options for children and inexperienced cyclists as well as more challenging terrain for those looking for adventure. The end of spring, in June, brings a number of festivals that I want to mention briefly. In June-July, you can celebrate Maine’s maritime tradition with at the Annual Heritage Days in Bath, Maine. Also in June, the La Kermesse Franco-Americaine Festival in Biddeford offers an opportunity to celebrate and explore Maine’s Franco-American heritage. With spring comes mud season in Maine. I remember describing this to my husband – the melting of the snow and frost, in combination with spring rain, and the results – deep, squishy, dirty mud. Lots of it. The defining image of mud season in my mind comes from my childhood – we lived in a white farmhouse at the end of a dead end road – and every spring, the mud would seep up between the walkway stones, making it impossible to venture from the car to the house without your feet being enveloped in it. And every spring, my parents would set out a series of low, wooden bridges, made of 2-3 planks each, lifted about 4 inches off the ground, so that we could more easily (and cleanly) manuever from the car to the house. I will remember the clattering noise of feet, planks, and stones all my life, I’m sure – as well as the childhood joy of leaping from set to set, making it more of a game than a walk. So – may you enjoy the best of springtime in Maine, with mud kept to a minimum! Categories: Play, Special Memories | Tags: Acadia National Park, Coastal Maine Botanical Gardens, hiking, Maine, Saddleback, spring, spring skiing, Sugarloaf, Sunday River | Permalink.